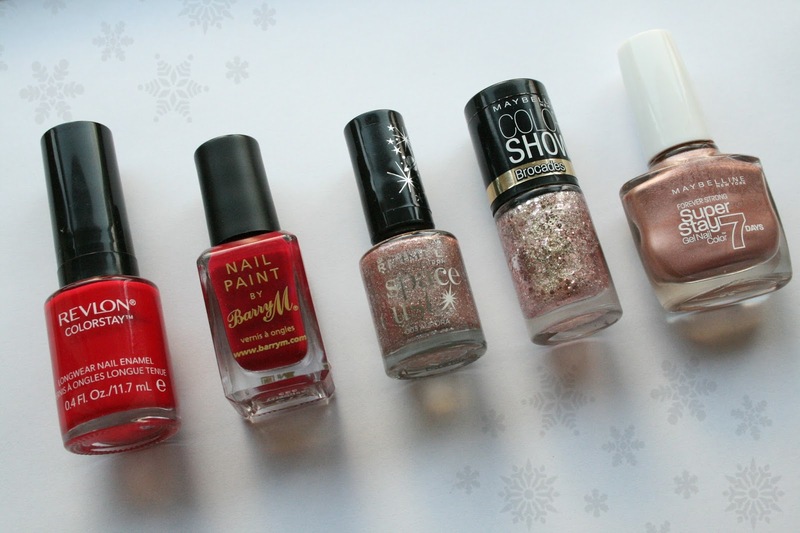 Today I'm bringing you guys my five nail polish choices for this holiday season. I'm definitely going to be wearing these gorgeous, festive colors throughout the month of December. This is the perfect classic red nail polish. I think the Revlon Colorstay nail polishes might be one of my faves, I love that the brush is flat and wider than normal, so it applies fast and evenly. It's glossy, very pigmented and the perfect color for Christmas! If you like more dark toned nail polishes, this the the one for you. It's a beautiful medium-dark purple with red undertones. This applies very smooth and evenly. It's very glossy like the revlon nail polish and it's a lovely color to wear throughout the month of December. The perfect eye catching, but still subtle Christmas and New Years Eve color. It's a gorgeous metallic rose gold, that's very pigmented. This polish will give you the perfect amount of glam, without being all glittery and for some people too much. I adore this polish and will definitely be repurchasing this, when it runs out. Now moving on to the sparkly ones. This one from Rimmel is both cool and girly, because of the sandy texture it has when it dries and girly, because of the sparkly glitters. It's a light rosy color, with silver glitters and this will definitely be great for new years eve! I wrote a full review on this nail polish, check it out here. This is again a glittery nail polish, I really only use this one on top of other nail polishes, like the rose gold I mentioned from Maybelline. Those two paired together is glittery heaven. The polish has a see-through shimmery gold base, with rose gold and gold chunky glitters. Sooo eye catching and definitely festive! It might be the combination I'm going to wear for New Years this year. I just wanted to mention this last thing quickly. The Sally Hansen Miracle Gel Top Coat! This is my all time favorite top coat, nothing beats this! It's meant to only be a top coat for the Sally Hansen Miracle Gel line, but in all honesty it definitely can be used on regular nail polish as well. It doesn't stay as long, as if you paired the polish from the line, with this top coat, but it does make my nail polish last way longer, than it would with a normal top coat.